My dissertation focuses on the chemical evolution and production of the light elements, specifically the odd elements chlorine and phosphorus. 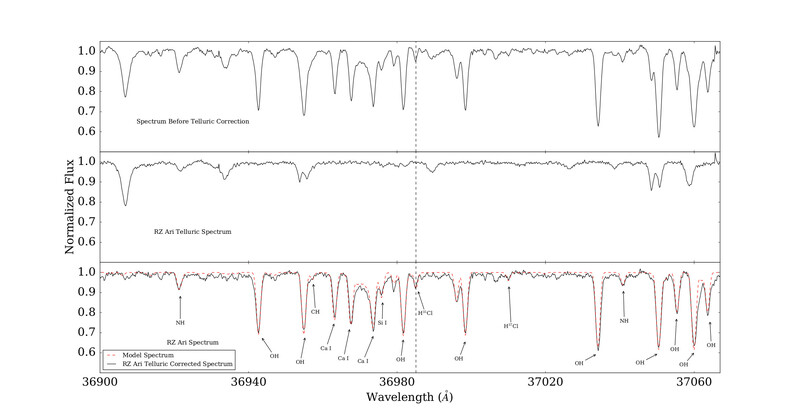 I measure chemical abundances from stellar spectra using MOOG. Additional Python/Pyraf scripts have been written to aid in data reduction and analysis. I also enjoy observational astronomy; I have led multiple observing programs as the principle investigator using the NASA IRTF telescope, APO 3.5m telescope, Gemini South, and Gemini North. One of my responsibilities at IU is teaching. I have been an instructor of record for an introductory online astronomy course (A107: Art of Astronomy) and co-taught the course with a fellow graduate student. I am interested in the best ways to develop material and engage students in an online course setting. I co-taught introductory astronomy class with an enrolment of 45 students as instructor of record. Course title was A107: The Art of Astronomy and we instructed on the science behind popular astronomical images. We developed activities for the online class including labs with Adobe Photoshop and Stellarium software, wrote quizzes, and created the syllabus. Developed online course activities and materials, guest lectured, led discussion sections of 10-20 students, set-up and led student rooftop observing sessions and solar labs. © 2017 Zachary Maas · Powered by the Academic theme for Hugo.